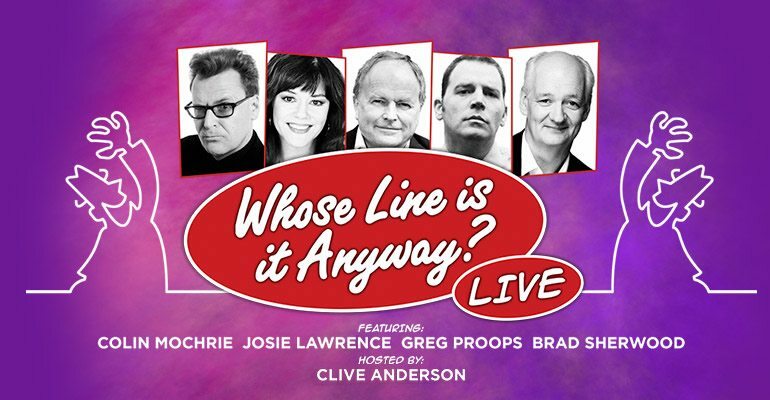 Adelphi Theatre London - Whose Line is it Anyway? "Expect all the fun of the television programme - only this time live on stage!" For the first time the stars of much loved improv TV show Whose Line is it Anyway? take to the stage to perform live. Clive Anderson who presented the hit Channel 4 show during the 80’s and 90’s will head up the cast that includes Greg Proops, Colin Mochrie, Josie Lawrence and Brad Sherwood.Whose Line is it Anyway? Live will follow the original format where four performers play improvisation games and make up scenes, characters and sometimes even songs on the spot from stimulus suggested by the audience or host. The live show will feature some of the classic games as well as some new ones designed by the original co-creators Dan Patterson and Mark Leveson. The show will make its world premiere at the Adelphi theatre from the 20th of June and play a limited two week season until the 5th of July. The show was fantastic. I almost felt exhausted from laughing for two hours after watching the show this evening 22nd June seated in the 'Gods', the audience up there were a mixture of teenagers, students, OAP's (including me), and we all had something in common, appreciation of a good quality show which was delivered by talented, comedic, professional and amazing thespians. I wish you all every Good luck with the run of your show. Thank you all for a wonderful evening.